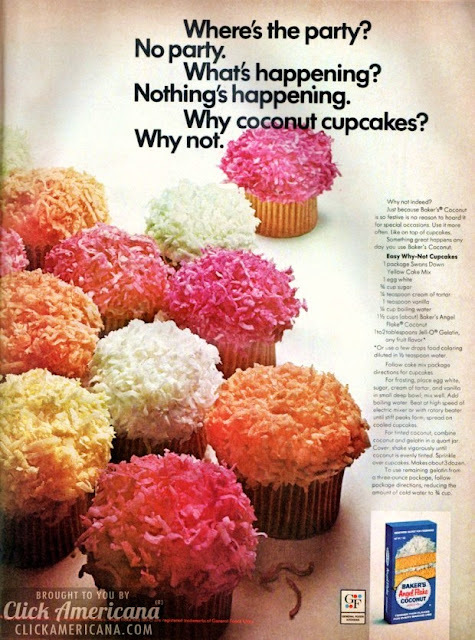 Farm Girl Pink....: ~ Vintage recipes - Coconut Cupcakes! How amazing are these cupcakes! I love a cute cupcake. Especially one that is not difficult to decorate. But brings all kinds of amaziness to a party. So this sweet little beauty, is from Baker's Angel Flake Coconut @ 1967. Back when a cupcake recipe did not require a masters degree, to get it to turn out. ha! Labels: Baker's Angel flake coconut, Coconut cupcakes, too cute to eat!